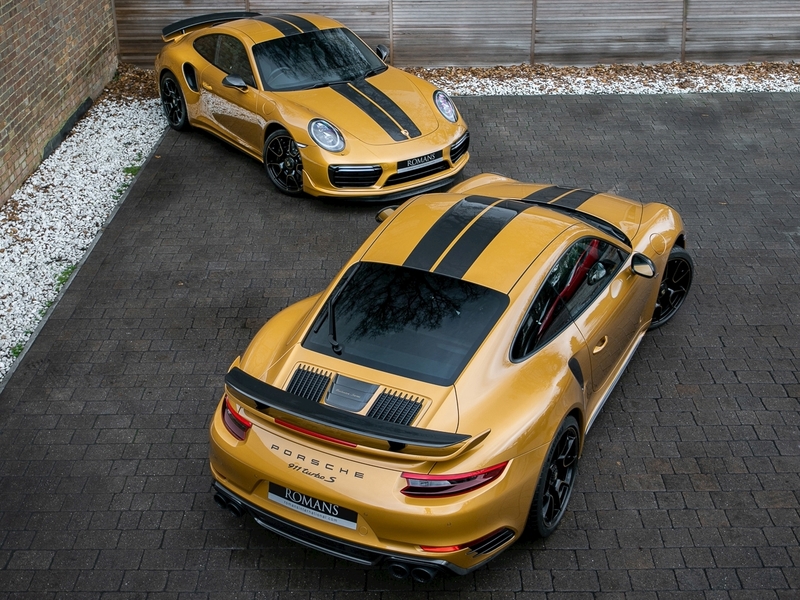 The Porsche 911 Turbo S Exclusive Series is one of the rarest and most exquisite cars to leave the Weissach factory in modern times. 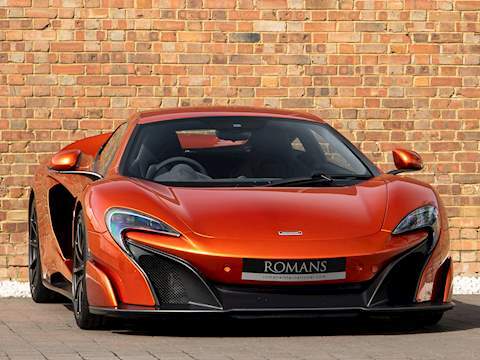 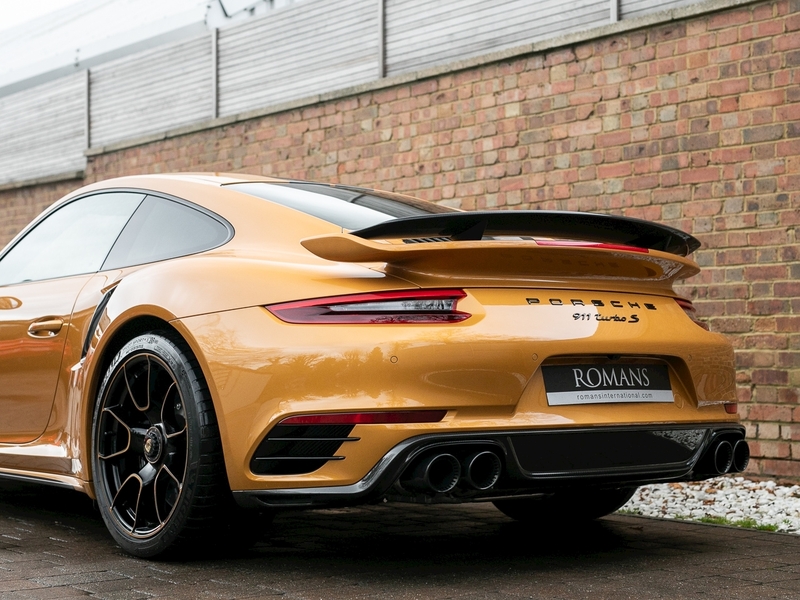 Production has been limited to just 500 cars worldwide with only a small handful of these making it to the UK; believed to be around 29 registered examples on British soil. 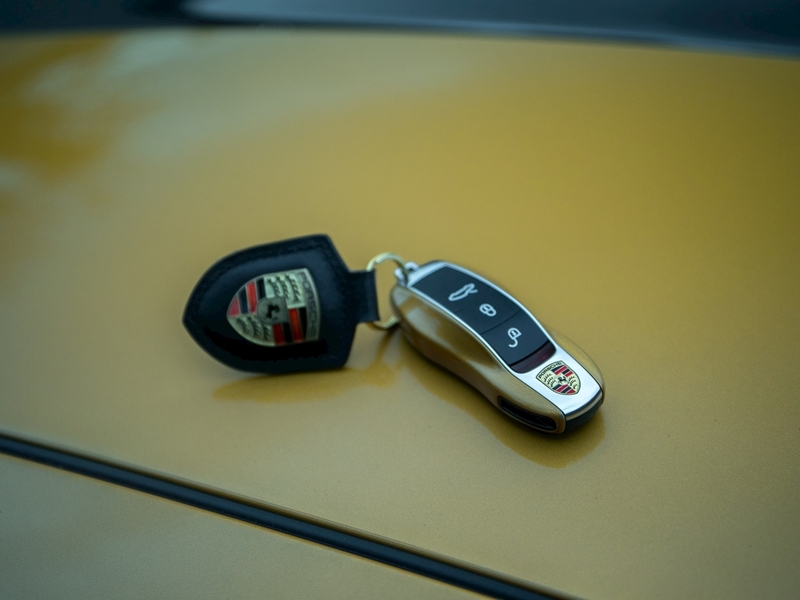 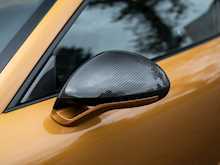 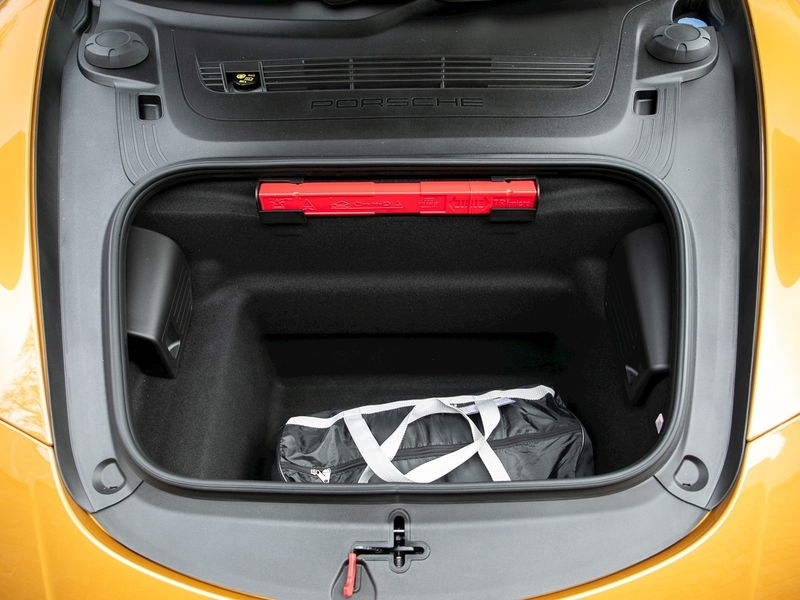 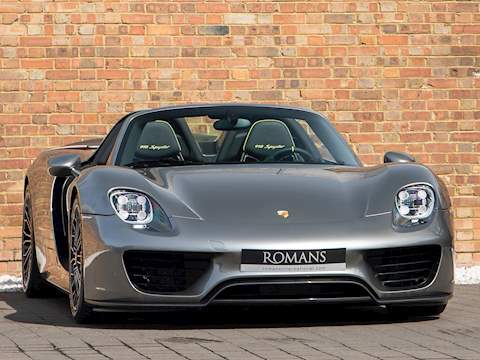 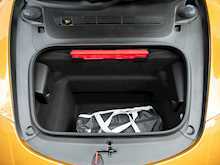 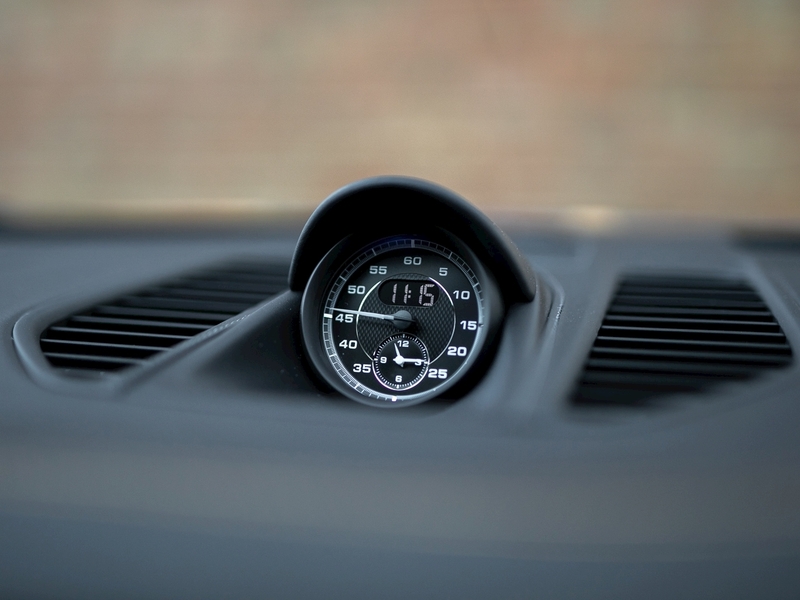 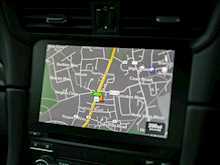 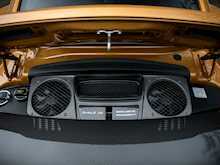 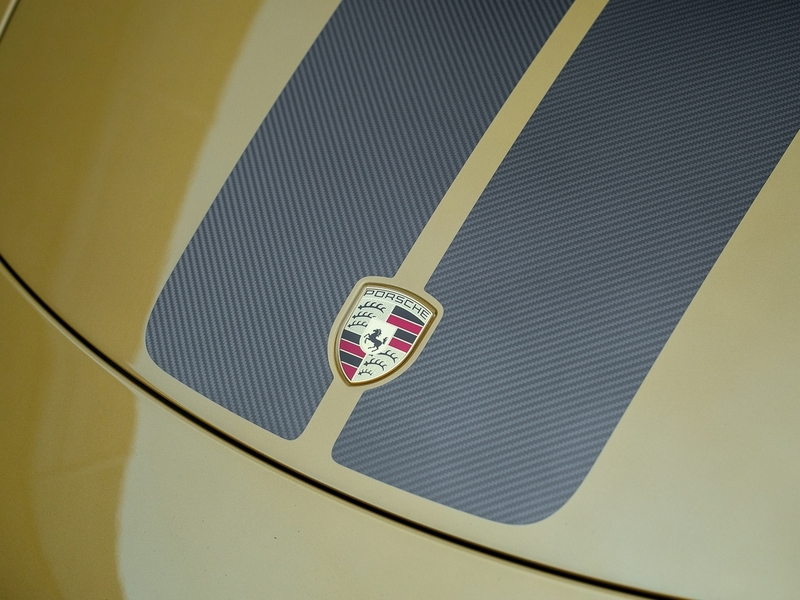 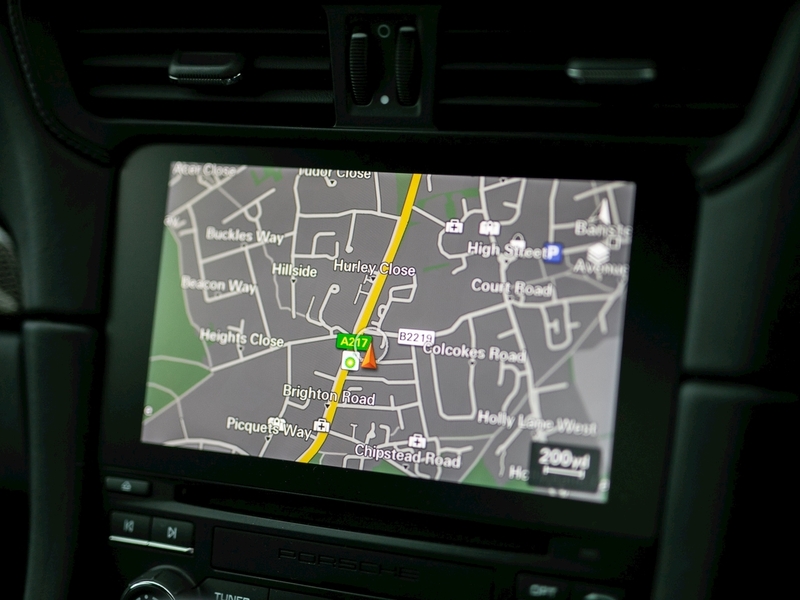 These cars were extremely difficult to get an allocation for from Porsche, with even some of the most serious Porsche collectors and customers missing out on a car. 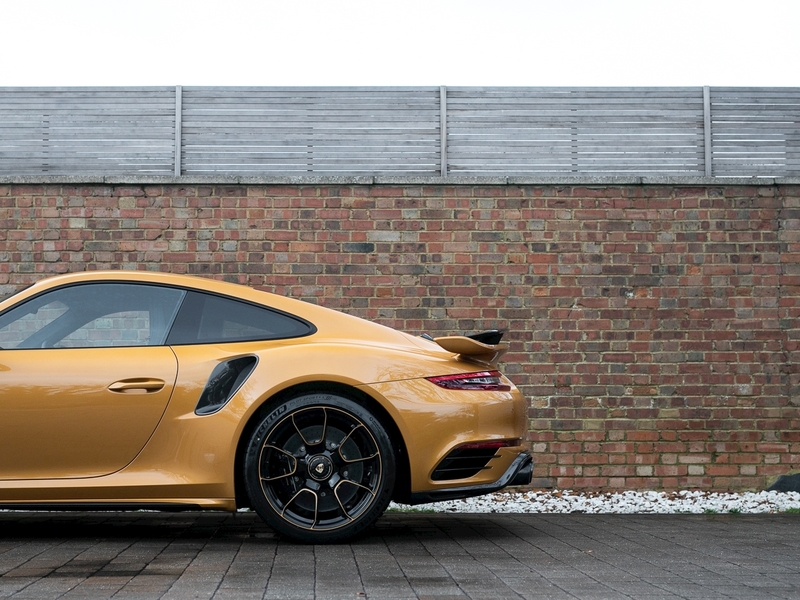 Mechanically the chassis and suspension setup remain largely the same, the phrase “you can’t improve on perfection” springs to mind. 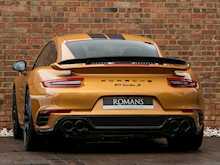 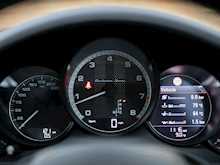 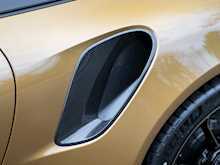 However, the engine does receive a power boost to just shy of 600bhp resulting in an improved 0 to 124mph time of just 9.6 seconds. 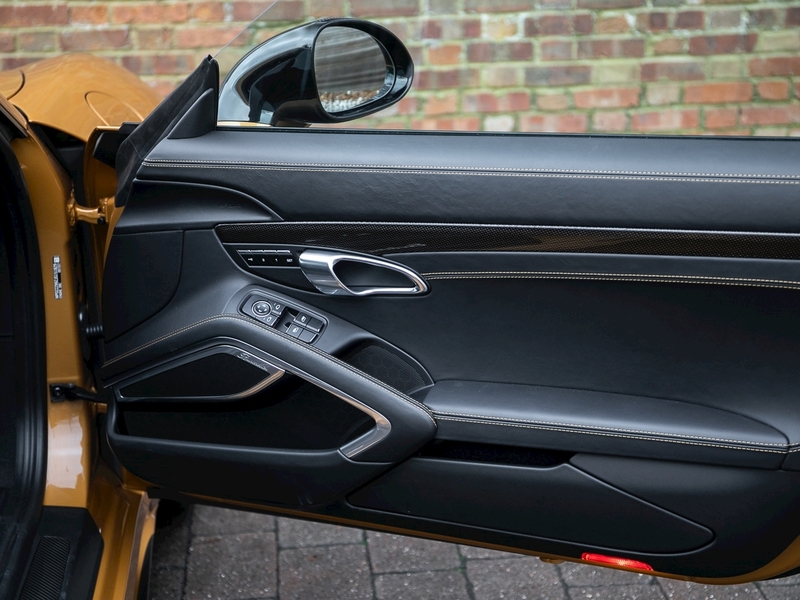 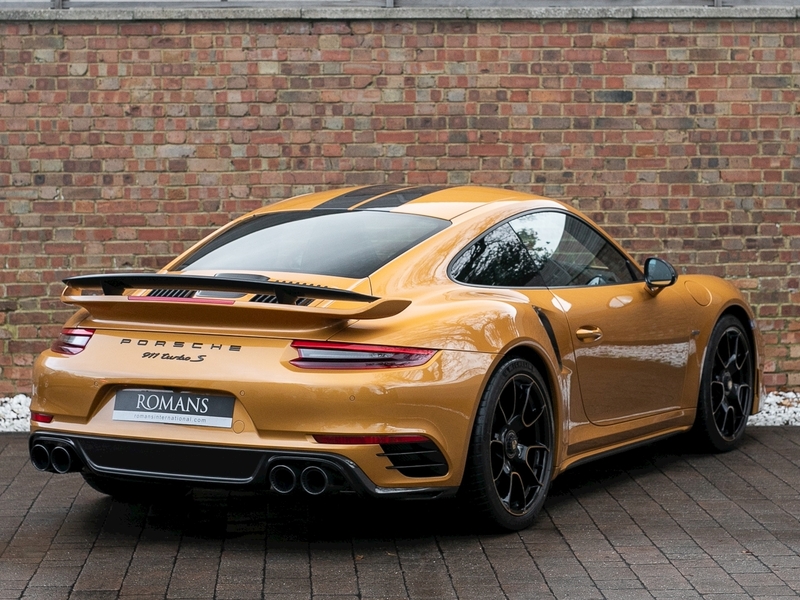 From an aesthetic stand point the Exclusive Series features a number of exterior changes, first and foremost is the sparkling exterior paint work, this example is sporting the exclusive Golden Yellow Metallic paint which is widely agreed as the best colour for this model. 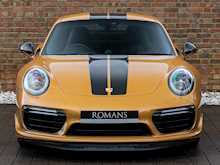 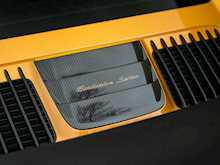 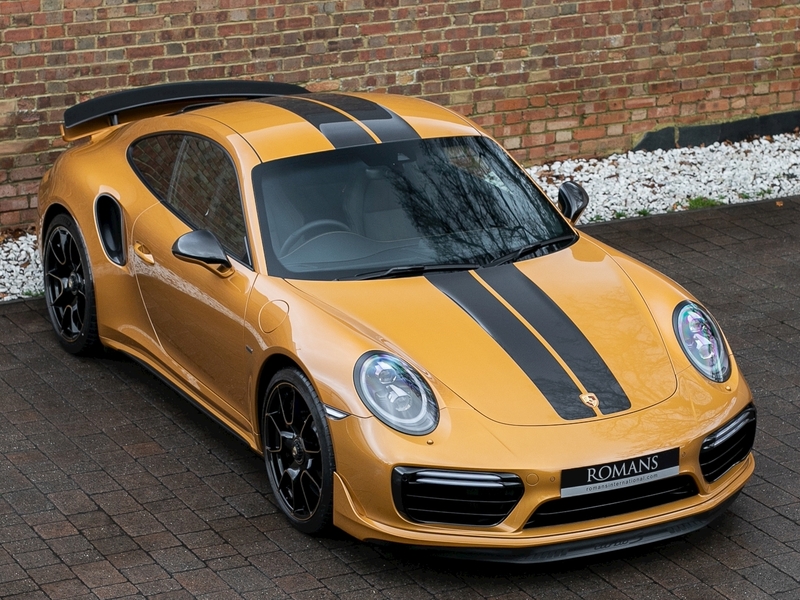 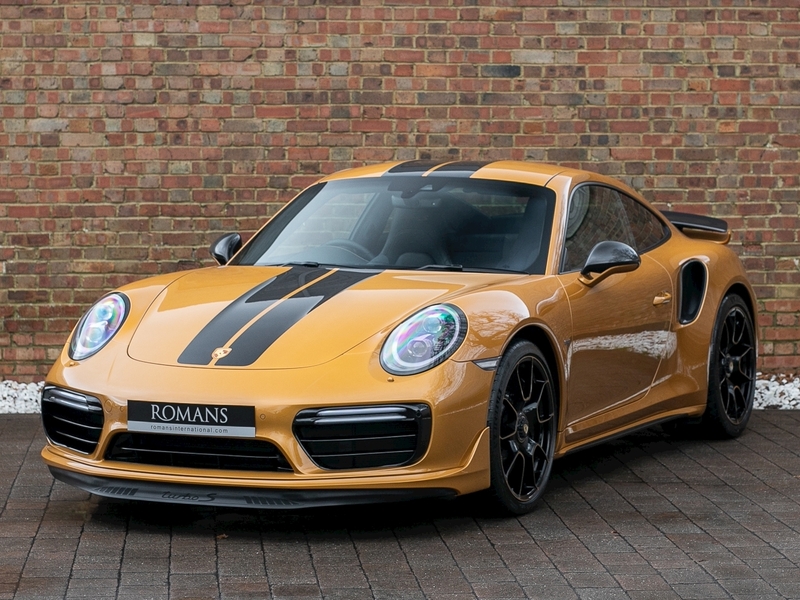 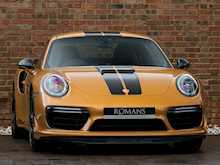 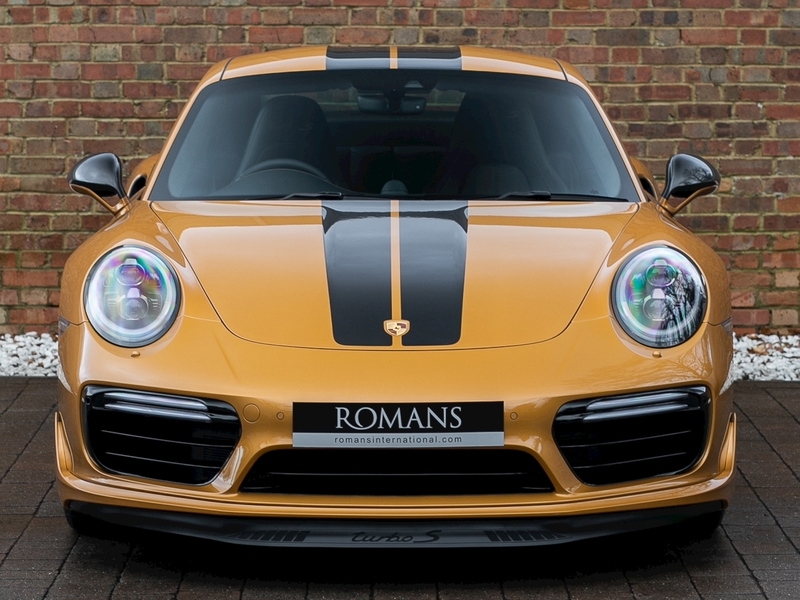 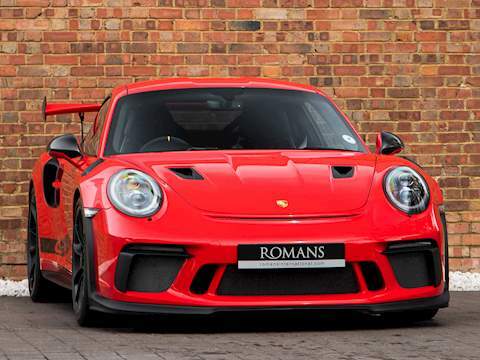 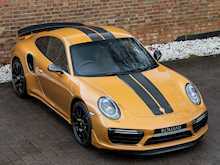 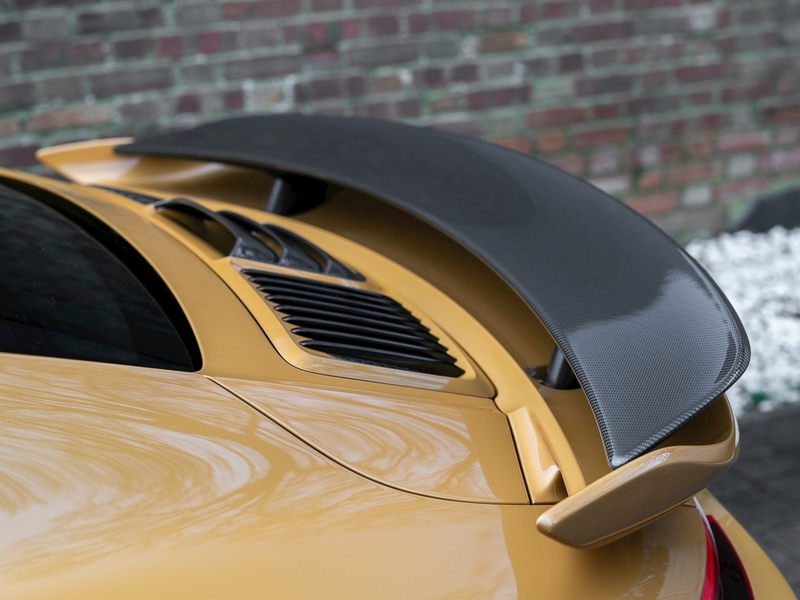 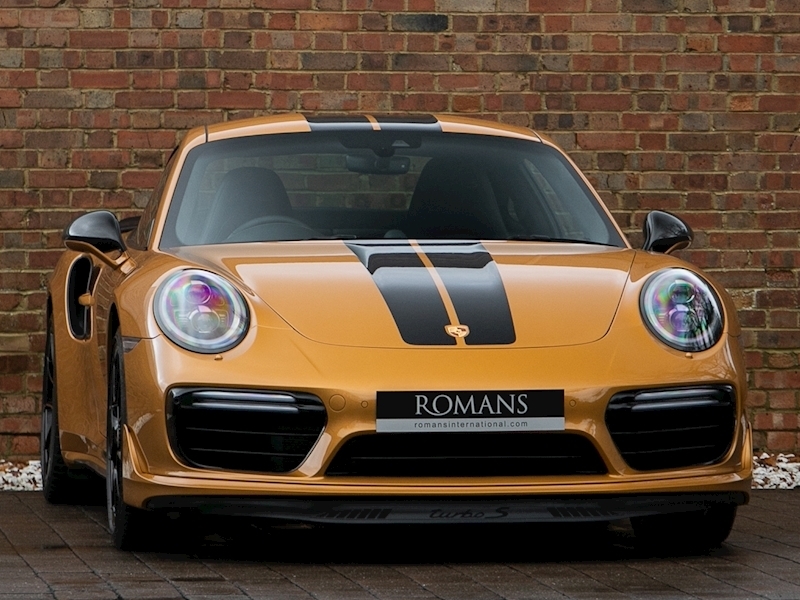 The new carbon fibre bonnet and roof feature exposed stripes similar to those seen on the GT2 RS and are complimented with additional carbon fibre sills, rear wing section and air intakes. 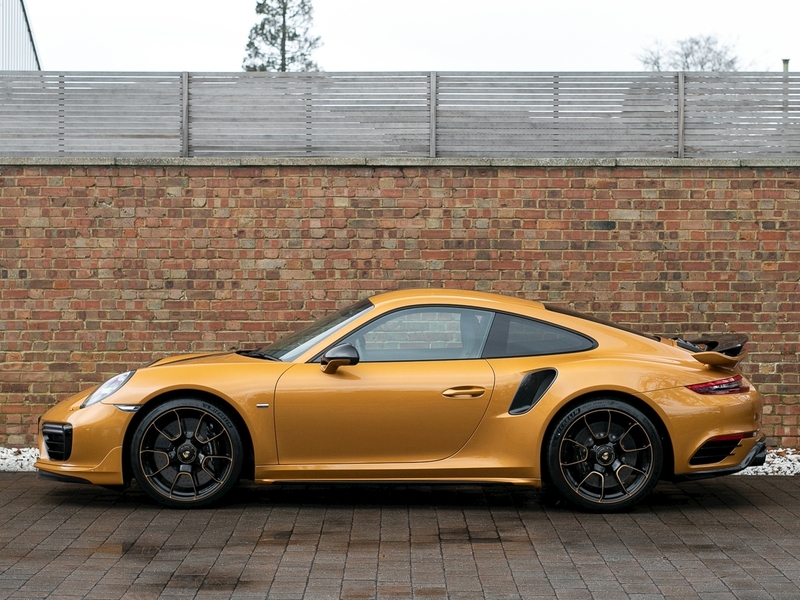 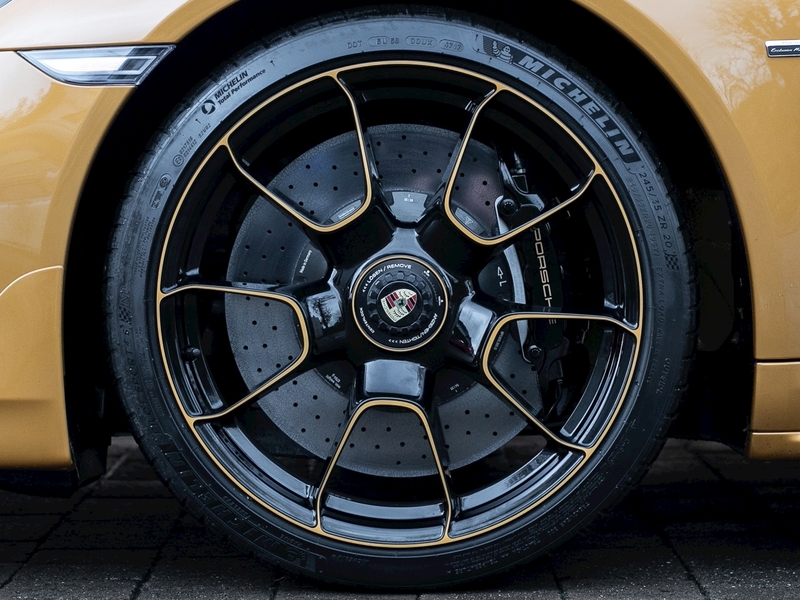 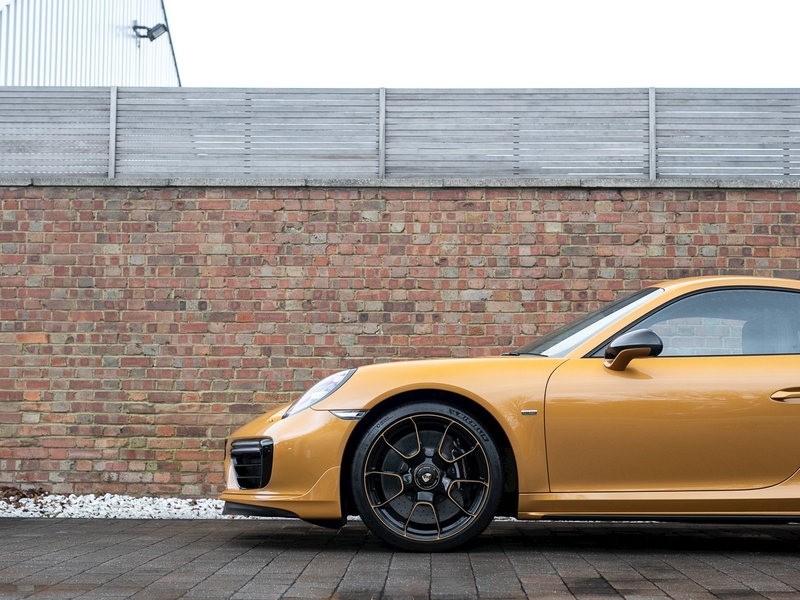 Yellow calipers should appear as standard on the Porsche Ceramic Composite Brakes (PCCB), however the Exclusive Series continues the colour scheme further with gloss black calipers and contrasting gold Porsche lettering to compliment the 20” black and gold alloy wheels. 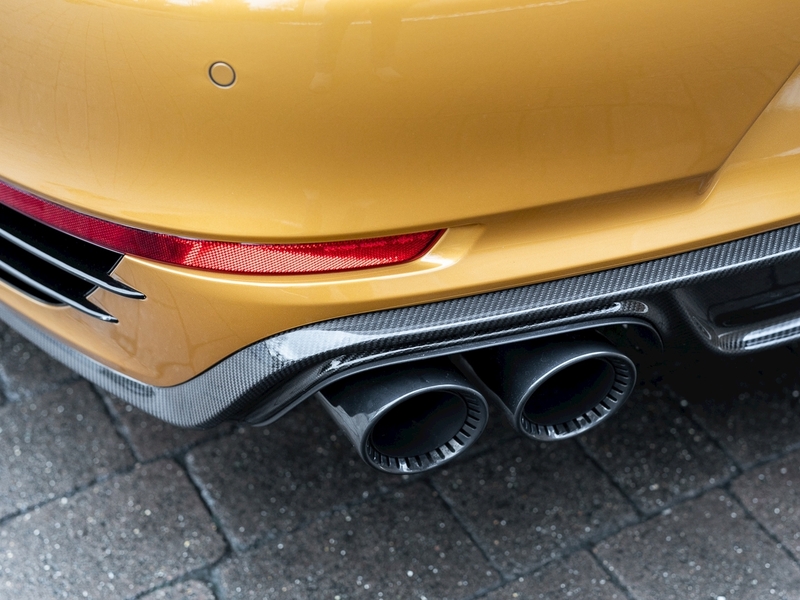 A reworked diffuser and black rifled exhaust tailpipes give the rear of the car an even more aggressive look than before. 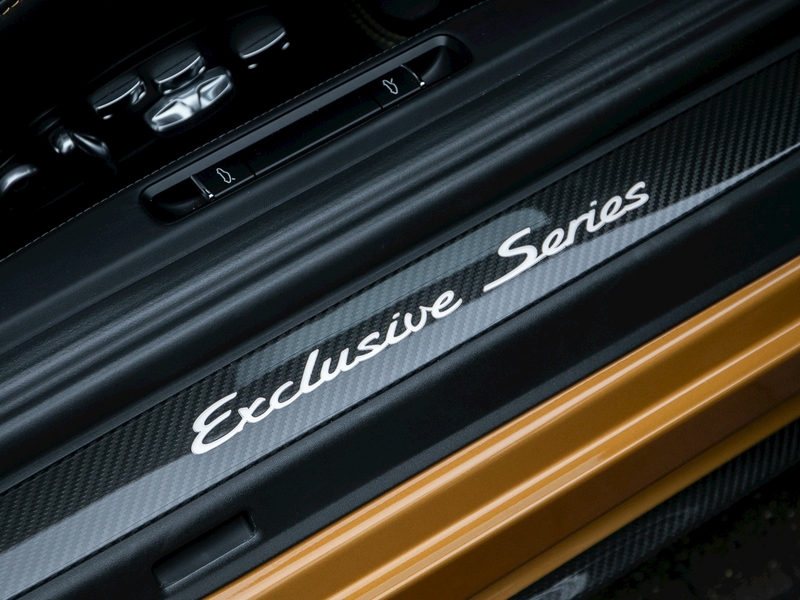 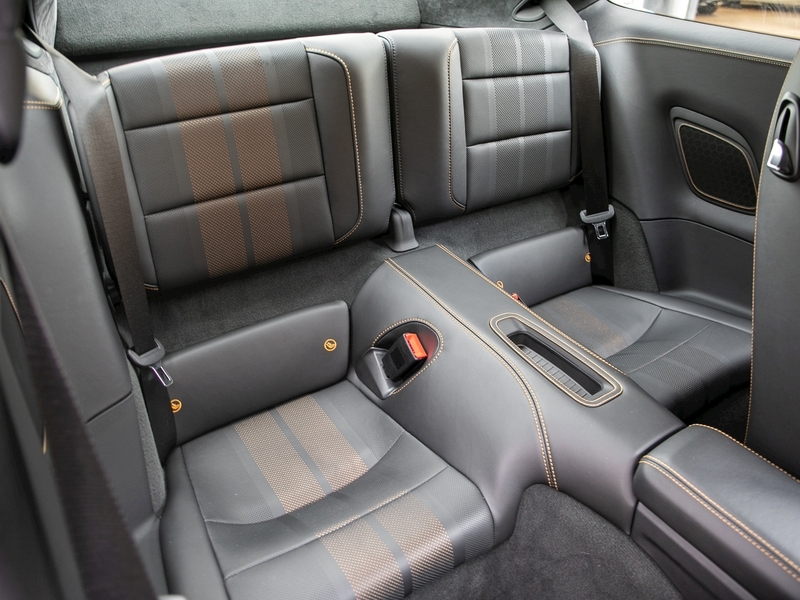 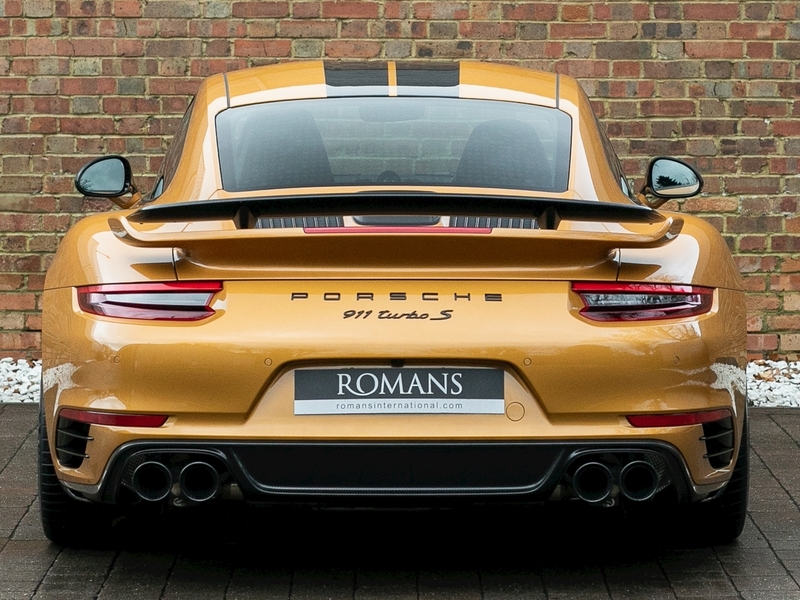 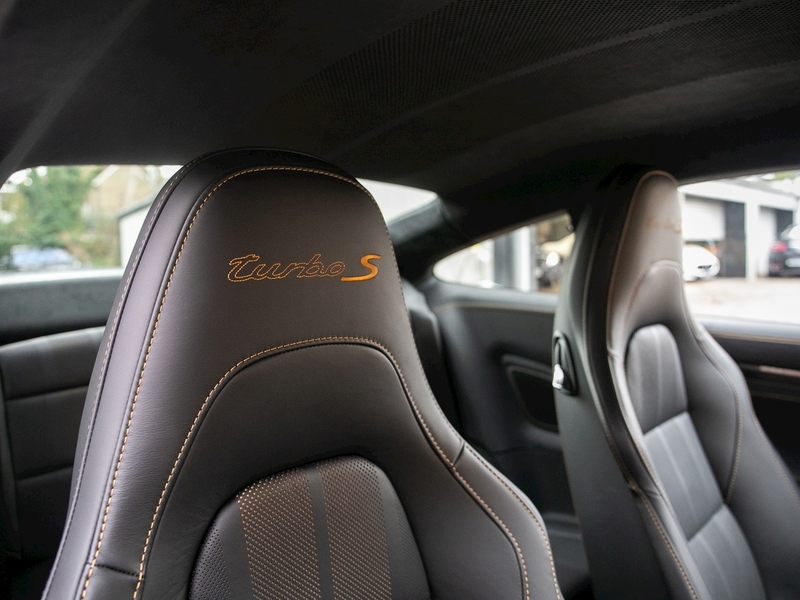 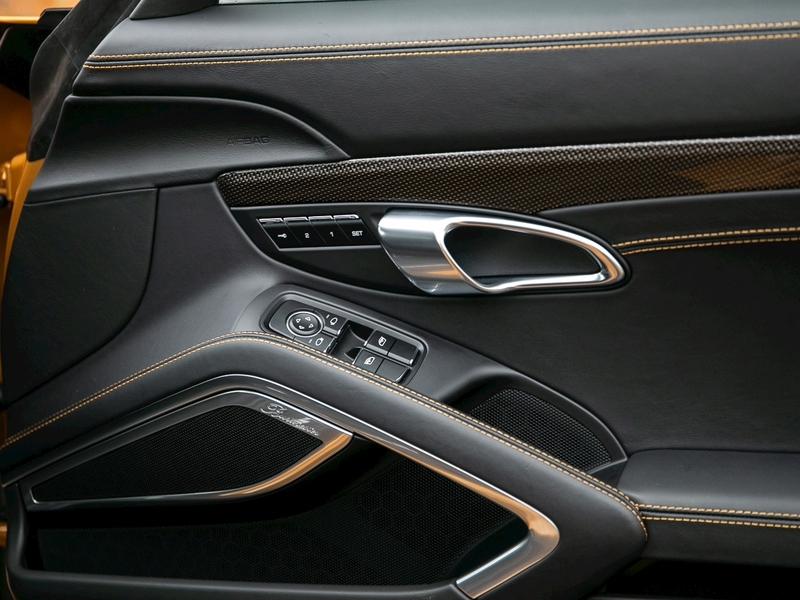 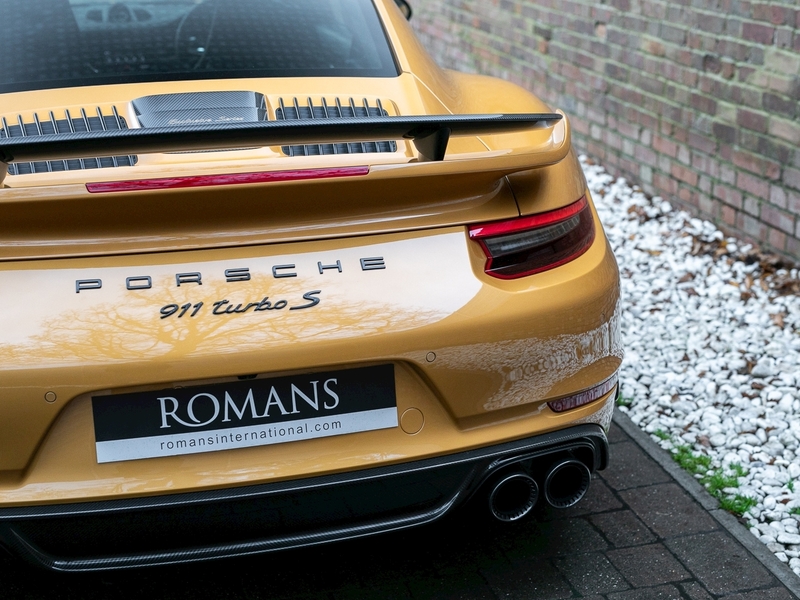 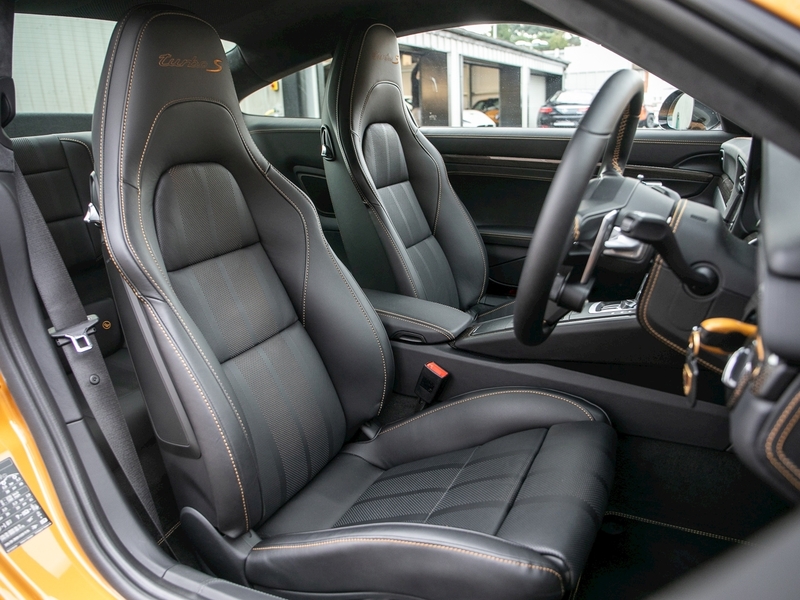 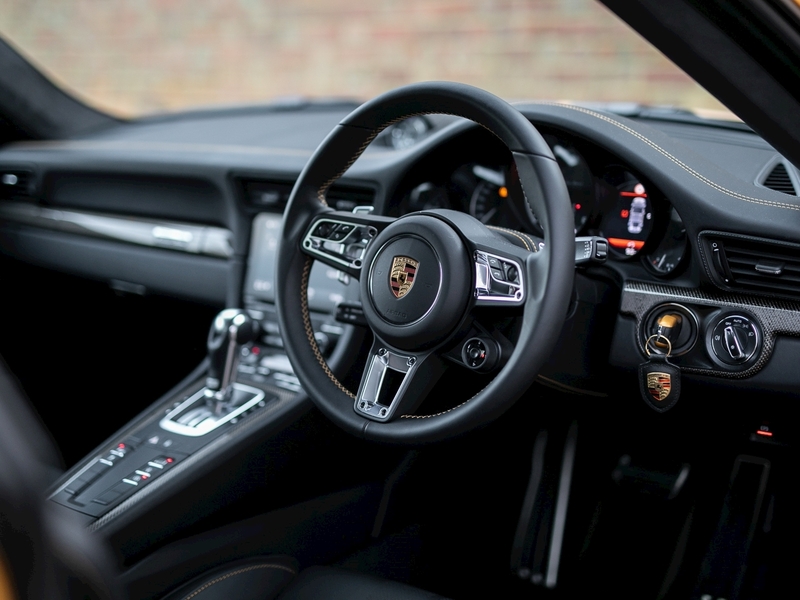 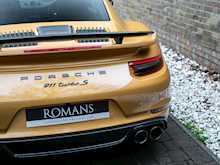 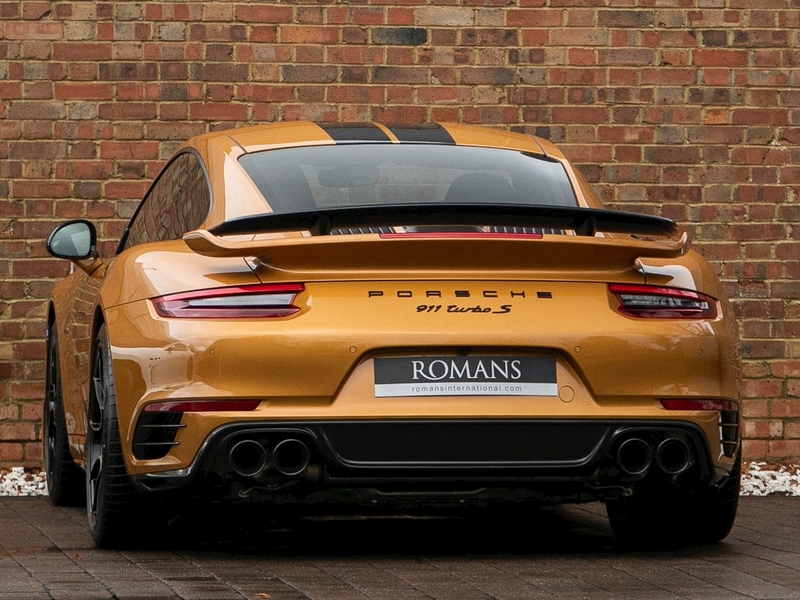 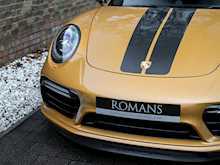 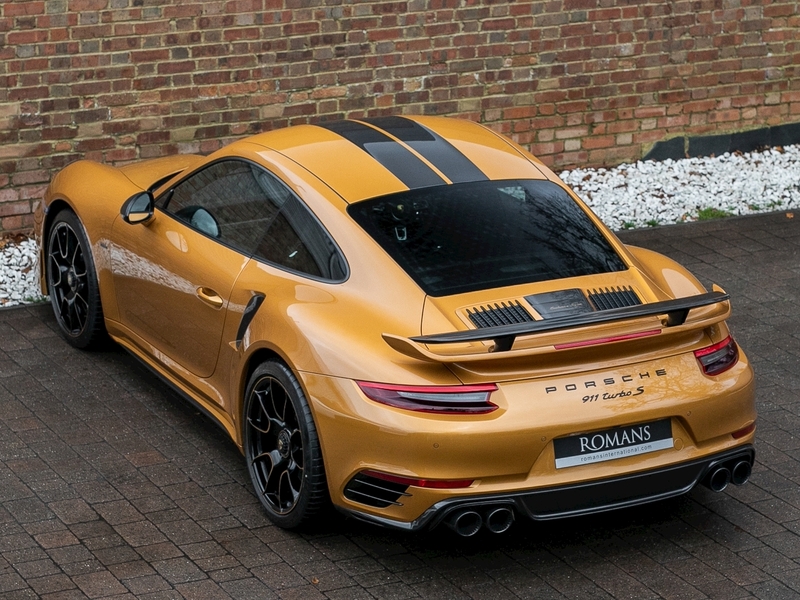 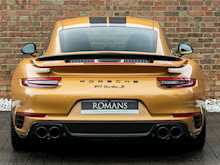 Additionally a healthy smattering of ‘Exclusive Series’ badging and embroidery throughout this Turbo S along with a gold carbon fibre weave, contrast stitching and striped seats help to immediately differentiate it from a standard Turbo S. Overall, this is a supremely rare opportunity for serious enthusiasts and collectors to buy a delivery mileage example of the ultimate version of the Turbo S in this definitive exclusive colour.